Recently, I was overcharged by two companies. Oddly enough, both of them stem from Western Pennsylvania USA. The first company, Giant Eagle, remedied the situation immediately. I bought some toilet paper on sale and was charged the normal price. When my total bill came out higher than expected, I checked the receipt and discovered the error. The clerk checked things out and verified the error. I only wanted the difference between the sale and regular price back, but the store gave me the toilet paper and gave me back the entire price I had paid for it, apologizing for the error. Wow! That experience stood in stark contrast to the other. I had insurance with Erie Insurance through the Myers Insurance Agency in Lakewood, Ohio USA for many years. I moved and went through some other major life changes last year, and even though I had paid for a year's worth of auto insurance back in May, my agent oddly insisted that I open up a new policy, pay for it, and then the money that I paid for my old policy would be refunded. When no refund eventually showed up, I inquired about it. When I didn't hear back from my agent after 11 days and several followups, I just contacted corporate, specifically the CEO, since he always stuck his name on the letters I would get from the company. He sicced a snotty secretary on me, who gave me various goofy reasons why I wouldn't get a refund. Finally, I just ended up getting new insurance and canceling all my policies with Erie. I also complained officially to the Ohio Department Of Insurance. I was prepared even to buy a share of stock in the company just to show up at the annual shareholders meeting to complain. Fortunately, I didn't have to buy stock in such a crappy company since, amazingly enough, my refund for the old policy finally appeared. One of these companies I will patronize again; one I will not. You can probably guess which they are. Companies can learn a lot from this juxtaposition. If you want to keep customers, treat them well and fix any mistake promptly. Most people understand that mistakes can happen, so if the situation is resolved quickly, it's usually forgiven. 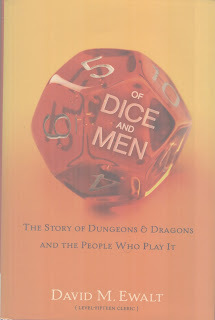 I played Dungeons & Dragons as a kid, so, as an adult, I was interested when I heard about Of Dice And Men: The Story Of Dungeons & Dragons And The People Who Play It by David M. Ewalt. Ewalt does a fine job of telling the game's origin, while contextualizing it by exploring the history of games in general and his personal experiences with the game. He even makes the history more fun by illustrating it with scenes from a campaign he played in at the time of the writing of the book. I don't think the book will inspire me to join a D&D campaign anytime soon, but it is fun to relive some memories and learn about the background that helped to spawn them. Sure, it's a fake holiday brought to you by people who have a vested interest in handwriting, but it's a fun one, even if most of the arguments for the continued teaching of cursive writing are basically nostalgic nonsense, so put your John Hancock on something! 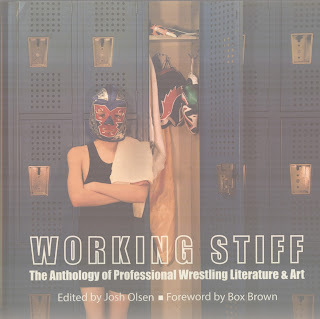 I got a treat in the mail, a copy of the new book Working Stiff: The Anthology Of Professional Wrestling & Art. It looks great! I am excited to read it! Editor Josh Olsen did a fantastic job putting this together. 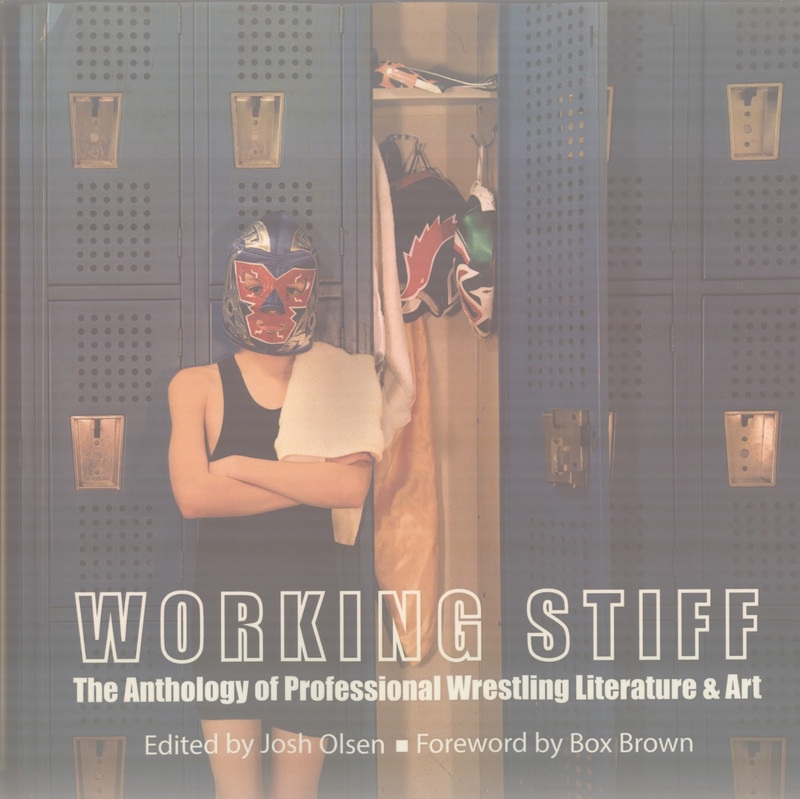 It features many artists and writers sharing their work with professional wrestling as the subject. I am happy to be among such a great group, including my zine pals Crazy Carl Robinson, Michael Grover, Leopold McGinnis (who includes me in the wrestlers his wrestler faces in his poem), and Pat King. 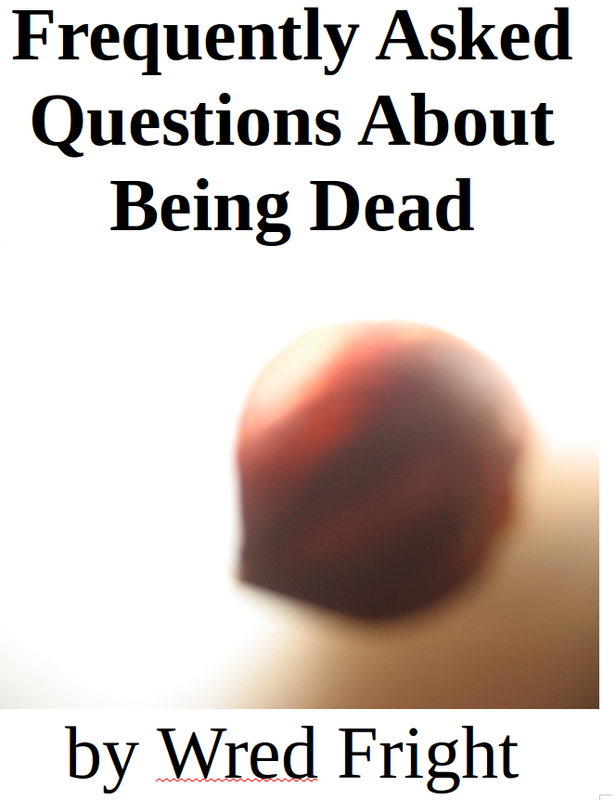 My contributions include a sonnet about WrestleMania, which has never before been published (I wrote it before Rowdy Roddy Piper died, so it's even more poignant for me now), and excerpts from Blog Love Omega Glee. Reading this book will make a nice way to warm up January before the Royal Rumble! I was flipping through the latest Rolling Stone when I turned a page and saw a photo of Marlon James. I recognized him because he stayed at my house once. About a decade ago, I used to put up touring writers at my house. I had some fun folks pass through including Crazy Carl Robinson, Sean Carswell, Mike Faloon, and The Rev. Rich Mackin. It was nice cross section of the zine scene mixed with some other parts of the indie lit world. Marlon was traveling with Mickey Hess and Joe Meno. 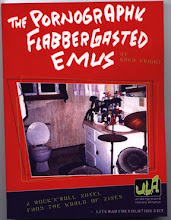 They did a reading at Mac's Backs in Cleveland Heights, Ohio USA back in August of 2005, and I provided the introduction for the audience. I don't remember much about the night in question, aside from Marlon advising me that if I ever wanted to hide something in Jamaica that I should put a book on top of it because no one would ever pick up a book. I assume that was a joke, but feel free to try it out when next hiding valuables in Jamaica. In any case, it is nice to see one of the many fine up and coming writers from that era make a larger mark in the world of literature. Marlon won the Man Booker Prize last year. Before him, the biggest celebrity who stayed over was probably Mariko Tamiki, who won a few awards for her graphic novels years later. I no longer put up random strangers at the house (one too many folks wouldn't even leave a zine behind as a thank you for saving them a hotel bill, and one time I even had to mail someone's forgotten towel back--ugh! ), but mostly it was a fun little era while it lasted. Readers should check out some of the other writers I put up. They're very good also. It's winter now, but soon enough it will be spring, and many people will celebrate by poisoning their lawns and gardens with a bunch of chemicals that really aren't much good for anyone. I was just reading a Greenpeace publication discussing how 31% of the nation's honeybee hives collapsed last winter. Most of this is blamed on types of insecticides known as neonics, but Bonnie Coblentz, in this interesting article, suggests that herbicides may also be a threat, since destroying "weeds" is also destroying the food of bees. Since I don't use herbicides, that might be why all sorts of insects, including bees, seem to enjoy my lawn, especially when the mint plant is in full bloom in late summer. A swarm of pollinating insects surround the mint looking like a cloud of hurt to any human that approaches. However, the insects are usually so wrapped up in the mint that they have little interest in anyone who approaches it. Just don't get between them and the mint. Pick some leaves for your tea or whatever and back away. I hope more people just let the dandelions and other plants in the lawn "bee" this spring! "Food Not Lawns, Cleveland, 6th Annual Seed Swap! If you are interested in gardening, community, food security, permaculture, seed saving, and sharing, this is the place for you! Bring saved seeds if you have them, or consider what you might swap for seeds in goods or service, but come anyway. We will have starter seeds available and lots of information to share. We have signed the Safe Seed Pledge and will not knowingly share gmo/Monsanto owned seed. Don Abbott, aka The Snarky Gardener, with seeds and literature. Refreshments are potluck. Please bring a dish to share ( and indicate if it is vegetarian, vegan, gluten-free or meat). Also, collecting non-perishable food donation for Hts. Emergency Food Bank . There will be a Freecycle table available to bring or take useful items. Residue will be donated. Please label saved seed with as much pertinent info as possible. We will have envelopes and labels available. Seed Savers who are willing will be with their seeds at tables to discuss traits, growing conditions, stories about them, and aspects of seed saving. Donated seed will be available and asked to be considered a 'loan' to be returned, if possible, the following swap. The completed Saved Seed Inventory is available for perusal, or check it out online, at: bit.ly/seedsave. Freecycle info: Please bring gently used (or new) items to donate/swap. If you have items left at the end of the day, take them home or leave them for donation pick-up Monday morning. This event is free (donations gratefully accepted), child-friendly, on a bus-line and handicapped accessible. Volunteers are needed to help set up and clean up. Feel free to share this info., and contact me at foodnotlawnscleveland@gmail.com for more info. Hope to see you there!" I was reading this year's Liberty Annual by the Comic Book Legal Defense Fund, when I noticed the list of corporate members. It has most of the large comic book companies such as DC and Image listed, but one stood out by its absence: Marvel. I'm not quite sure why that is. Presumably Marvel's against censorship as well, but maybe their Disney ownership is squeamish about supporting an organization which defends freedom of expression right up to its extremes, which is, of course, where it always has to be defended as nonextreme expression seldom is censored. In any case, the comic is a good read. I particularly enjoyed R. K. Sikoryak's mashup of Dilbert and Herman Melville's "Bartleby The Scrivener". Maybe next year, Marvel will pitch in as well. 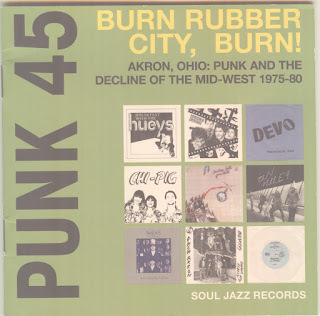 I have been enjoying the Punk 45 albums which, in the spirit of Nuggets and Shreds, compile a bunch of more or less obscure rock songs that deserve to be better known. In addition to the music, the liner notes accompanying the albums are also excellent. For example, the liner notes for the Akron, Ohio USA compilation, contextualizes the emergence of the punk scene there in the 1970s well (with the exception of confusing Market Street in Akron with Main Street in Kent--hey, the writer's British, so it's hard to get all the details right from a continent away) explaining how the decline of the rubber industry in the area merged with youth paranoia as a result of the May 4th Kent State murders helped to fertilize an experimental and self-reliant music scene. 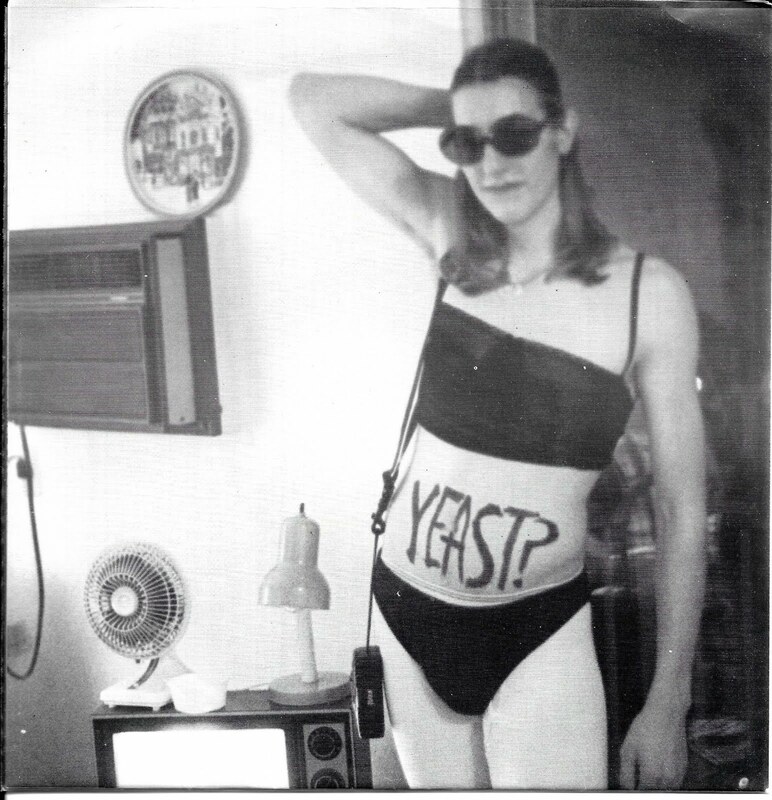 These albums are not only interesting listens, but they are also good reads.